Can play a key role to achieve the basics but essential objectives needed to survive and sustain in a difficult situation.. The name is given so because it can play a key role to achieve the basics but essential objectives needed to survive and sustain in a difficult situation in an unfamiliar terrains. 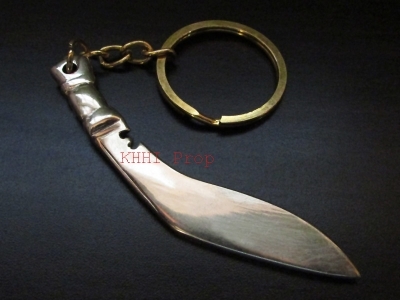 This 8 inch long bladed mini sized kukri becomes a very useful and realistic tool out in the wilderness to serve and to protect its master in the best possible way. Another strong contender of “Survival Series”, the “2 in 1” is made to give out the optimum answer whether be it at home or far away. Back Up / Baby Knife: The usefulness and uniqueness of the kukri; featuring a perfect handy size, excellent grip and superior scabbard is further boosted and taken to a next level up by the addition of an extra utility back up knife - to perform just about any cutting activities; small or big, minor or major. The small straight knife, crafted much stronger and better than the regular companion of a kukri (Karda) makes possible to cut even the smallest things and cuttings. This back up knife or feature will give much needed support making the whole knife package more useful and worthy to have it at Home or in Jungle. 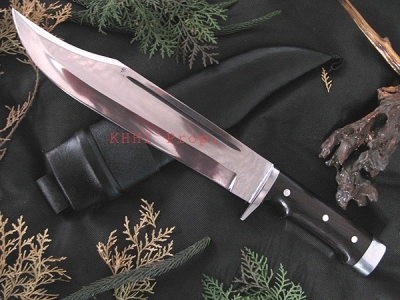 Blade: 8 inch long unpolished for rough and tough use. Simple yet style of its own. Beauty and beast combination. Handle: An important and unique aspect of the kukri designed to give a perfect grip, ideal balance and better feel. The contours or curvatures at the front edge (side) of the handle will ensure that the fingers and the palm get a sturdy and comfortable rest resulting into better grip and easier hold. Scabbard: Different and better format for the case is under taken. Here the basic plain wooden frame/box used underneath the buffalo hide is wrapped by waterproof “Cordura” fabric for beauty and durability. This type of scabbard is exclusively used to provide easier handling, safer housing, better carriage and nicer look to the kukri. 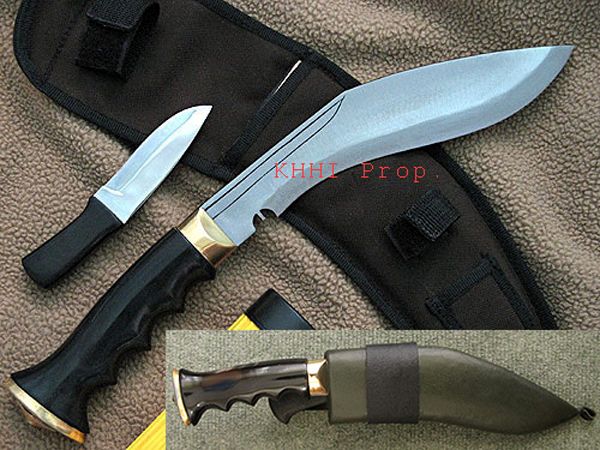 The army green or black color fabric houses both knives at once and is fitted with fastening belts to secure the blades, as depicted in the picture. Keeping customers’ first hand feedback, comments and quality in mind now the 8” the Savior (2 in 1) comes in a regular army green color leather scabbard having black carriage frog as shown in the inset. We therefore notify all customers to complete ignore the Codura sheath in the background.